Does this photo on Camac Harps “HarpBlog” look familiar? That’s because it is none other than our own Madeline Olson, who is featured as the Camac Voice of January, 2014! Madeline is a YAHS alumni and also the First Prize winner of the 2010 Young Artist’s Harp Competition, Emerging Artist Division. She is currently attending Juilliard, as a student of Nancy Allen. Madeline entered the first Young Artist’s Harp Competition in 2008, then came back in 2010 to win First Prize. “The Young Artist’s Harp Competition was a wonderful experience for me,” she told Camac’s Helen Leitner. 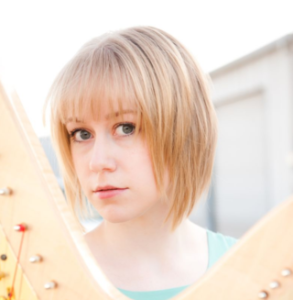 Read more of her thoughts on the Camac HarpBlog and listen to her performance of the Scarlatti Sonata in A, K209, currently playing on www.camac-harps.com. For more about this year’s Young Artist’s Harp Competition, July 2-5, 2014, visit our competition pages.